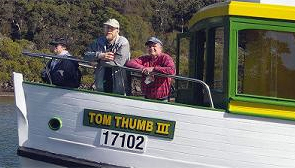 In 1796 Bass and Flinders discovered Port Hacking in the Tom Thumb II, a small 8ft long rowing boat and spent three days exploring and mapping Port Hacking. 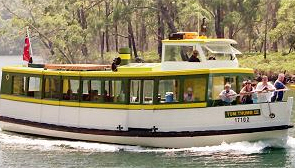 In three hours, cruising in the relaxed and informal atmosphere of the M.V Tom thumb III, you will enjoy exploring the upper reaches of the Hacking River, one of Sydney’s most unspoiled waterways, with its many bays and inlets down to the open expanses of Port Hacking and Bate Bay. You will see breathtaking views of the Royal National Park, which borders the whole southern shoreline. Learn about the early explorers of the district, Historical Settlements deer farming in the park, the states first fish hatchery. Pass through Aboriginal sites, whilst discovering their names and meanings, and cruise by some of Sydney’s most magnificent waterfront properties. A full commentary and morning tea is provided on all cruises. Places of both local and historical interest and significance are pointed out by our courteous and experienced crew. (with a Liquor licence). 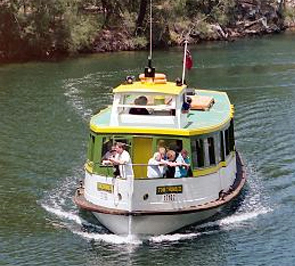 All cruises depart from the public wharf at Tonkin St, Gunnamatta Bay, just below Cronulla railway station. There is limited parking for cars and coaches.